Analysis: There's no upside to attacking a dead man, but Trump can't help himself. WASHINGTON — Picking on a dead man seems like the ultimate bully move. But president Donald Trump continues to trash the late Sen. John McCain, R-Ariz., all the same. "I was never a fan of John McCain, and I never will be," Trump said at the White House on Tuesday, showing that his grudges don't stop at the graveyard's edge. That followed a weekend Twitter tirade in which Trump identified "stains" on McCain's record that included his vote against repealing Obamacare and his role in forwarding a dossier on Trump to the FBI, which the president inaccurately said had happened before Election Day. It's hardly a secret that Trump hated McCain, who was a frequent target of his barbs on the campaign trail. But McCain, a former prisoner of war and the 2008 Republican nominee for president, is no longer in a position to defend himself. That hasn't stopped Trump from treating him like a foil in an ongoing celebrity feud. It's a one-sided fight, and one that has little obvious upside for Trump, who already has won over the set of Republicans who came to dislike McCain for his willingness to buck the party on a variety of issues over the years. 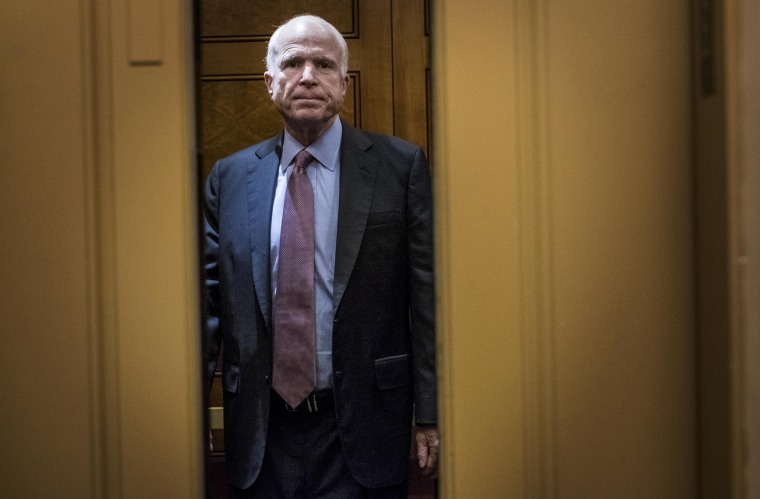 It's possible, though, that he could alienate Republicans who are fans of his policies but either remain respectful of McCain's service to his country or simply find the specter of publicly bashing a deceased rival to be beneath the dignity of the presidency. One former administration official said Trump wasn't thinking about political strategy but was instead just reacting instinctively to news reports mentioning McCain's role in handing over the dossier, which informed the FBI's investigation into the Trump operation's ties to Russia. The difference between Trump and others is that the president doesn't let it go at that. "Most people don’t act out on it," the official said. In McCain's absence, his family and friends have fired back at the president. Meghan McCain, one of the senator's daughters, described her father as Trump's "kryptonite" in life and in death on ABC's "The View." "Your life is spent on your weekend, not with your family, not with your friends, but obsessing, obsessing over great men you could never live up to," she said of Trump on Monday. "That tells you everything you need to know about his pathetic life right now." Left to his own devices, literally and figuratively, Trump has unleashed tweets hammering a series of real and perceived adversaries in recent days, some of whom are much closer in proximity. One of them, George Conway, is the husband of White House counselor Kellyanne Conway. George Conway, a frequent critic of the president, tweeted out a series of clinical definitions of various personality disorders from a psychiatric manual over the weekend in an apparent response to Trump's tirade. On Tuesday, Trump dubbed him a "total loser!" as he subtweeted an attack from his campaign manager, Brad Parscale, on Conway. But his aide's husband, who is very much still alive, had the ability to respond in real time. "Congratulations! You just guaranteed that millions of more people are going to learn about narcissistic personality disorder and malignant narcissism!" Conway tweeted at the president. "Great job!" Of course, Trump loves the attention — any attention — and there's no reason to think he'll stop fighting with the living or the dead. Many of his political supporters love his eagerness to engage in rhetorical combat, and others have long since dispensed with the idea that his behavior is more important to them than his role in nominating conservative judges or signing fresh tax cuts into law. Overall, Trump is unlikely to send Republican voters toward the Democratic column by going after McCain or any other number of targets, but his behavior could come at a marginal cost among a certain set of voters, said GOP strategist Michael Steel. "The criticism of McCain, like the payoffs to pornographic film actresses and angry unhinged tweets, is not likely to substantially change the course of the 2020 election," Steel said. "As long as the economy remains strong, these things are likely to be washed out by other factors. But there may be some Republicans who decide not to go to the polls because of the overall ick factor of the president." For Trump, strategy comes second to instinct, and his instinct is to fight. If an opponent is defenseless, it seems, all the better.